Welcome to the Anderson Seafoods Sweepstakes! Do you love seafood? I know we do! Seafood is always best when it’s super-fresh. Sometimes in restaurants or even at your grocery stores, the quality of the fish leaves a little to be desired. That’s because with each day seafood spends out of the water, the quality starts to deteriorate. Sure, it’s edible, but it may not be as fresh as one would prefer. What if I told you that you could have the freshest seafood available, delivered right to your door? The folks at Anderson Seafoods, a California based company, offer their customers premium, restaurant quality seafood that’s delivered at the pique of freshness. All of their orders are shipped overnight, and arrive at your door the very next day! Their product line-up is completely drool-worthy, and on average, are 7 days fresher than anything you’ll find at your local grocery stores. The difference is amazing, and can be tasted from the very first bite! Brandy over at Newly Crunchy Mama Of 3 recently reviewed the super-fresh offerings from Anderson Seafoods. You can check out her full review and get recipes for Louisiana Gumbo and Trout Piccata HERE. 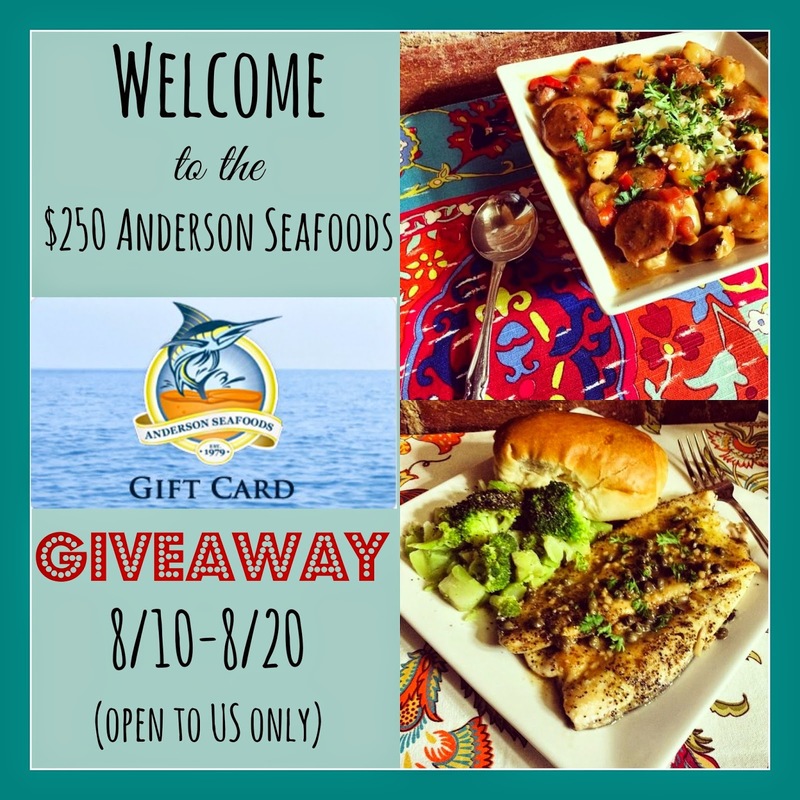 Enter to WIN a $250 Anderson Seafoods Gift Certificate! I’m thrilled to announce that one lucky reader will receive a $250 Anderson Seafoods Gift Certificate so they can check out all this amazing, fresh seafood for themselves! How cool is that?! This giveaway is open to residents of the US ages 18+ until 11:59 PM EST on 8/20/2014.Winners will be drawn using Rafflecopter’s Random Number Generator. All entries will be verified, so play fair! Winner will be notified via e-mail and they will have 48 hours to reply before a new winner will be selected. No purchase necessary. Void where prohibited. This contest is not affiliated with Facebook, twitter or Pinterest in any way. Thanks for entering, and Good Luck! I would love the Catfish, Rockfish and Salmon! I would get the tiliapia.